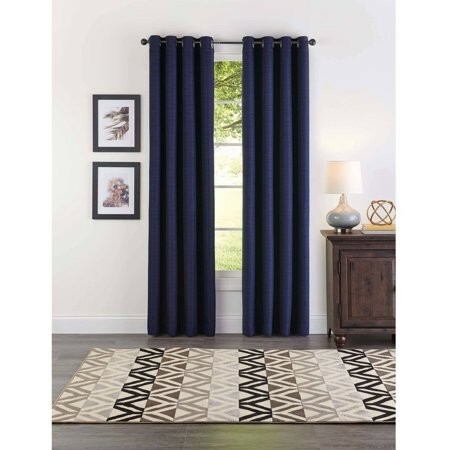 Better Homes and Gardens Solid Basketweave Grommet Panel Pair, Navy, 50" x 84"
Create a warm and inviting feeling to your home with these Better Homes and Gardens Solid Basketweave Grommet Curtain Panels! They include an opaque lining for optimal privacy that blocks out some light while not being a total blackout. 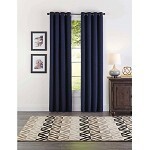 The 100 percent polyester curtain panel is constructed to be easy to maintain. If the panels get dirty or dusty, clean-up is simple because they are machine washable. The grommet style is reinforced with metal pieces that make opening and closing simple and quick. No more tugging on panels and compromising the strength of your curtain rod. Each neutral-looking Better Homes and Gardens curtain panel is designed to fit with most modern decor for a clean and friendly atmosphere!